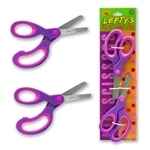 80 Packages of 2 pairs of colorful Lefty's custom left-handed scissors. • Includes 2 sizes - 9" long with 4" blades, and 8-1/2" long with 3-1/2"blades. • Comfortable molded soft silicone grips, designed for left-handed gripping, make scissors easy on the hands for substantial projects. • Scissors have easy to clean and durable stainless steel blades, and are intended for light general purpose use.